Now it easy for you to find Back pain treatment in Lahore at Zhongba hospital with best Chinese expert and professional doctors When you are experiencing back pain, the goals of treatment are to make you feel better and to get you moving freely and easily again. Your treatment options will depend on where your pain is happening whether it’s acute, sharp and sudden, it is causes by something specific or chronic and sudden, caused something specific or chronic may be lasting more than 6 months, perhaps lingering after an injury or illness has healed. If you are searching for Back pain treatment in Lahore than firstly you need to know about actually what is upper back pain. For other information call us� 03171172688 or� live chat with our experts…! Pain in the upper or mid back is less common than lower back or neck pain. The back is the region below the cervical spine (neck) and above the lower back (lumber spine). The back is called the thoracic spine, and it is the most stable part of the spines attachments to the ribs (rib cage) in the center of both spines. Since the vertebral bodies of the thoracic spine attached to the ribs, some patients experience pain when taking a deep breath, coughing or sneezing. 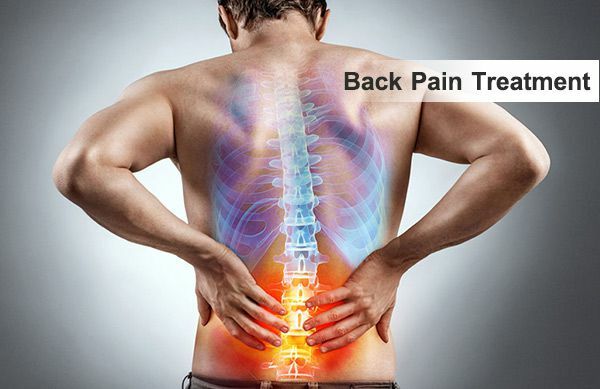 Seek emergency back pain treatment in Lahore if you want to get rid from these issues. Poor posture in general routine or habit, or walking at the computer for a long time without taking a break to walk around and stretch can contribute to back. Both muscle fatigue, muscle tend and muscle strain, which often result from poor posture, can triggered the pain. Unless you can’t move your body at all because of an injury, your doctor probably will test your range of motion, check how your nerve are working, and press on the back to zero in problem area. You might have blood and urine tests to rule out other problems, like an infection or a kidney stone. Doctors generally use imaging tests or X-rays for checking out ongoing pain and causes, if your back was hit by something, when you also have a fever, or you have nerve problems such as weak or numb arms or legs too. X-rays helps pinpoint broken bone or other troubles with your spine which are causing pain. An MRI or CT scan can show your doctors what’s going on the with soft tissue damage, such as a herniated disk. Live chat with us for best back pain treatment in Lahore and for more details and information. With acute pain, you should be able to start a normal, an easy activity, like walking, within a few days. After that, gradually ramp back up to your exercise levels. Strengthening both your abdominal and back muscles help to stabilize your spine. Pilates exercise level. Strengthening both your abdominal and back muscles build these core of muscles. You can help prevent further back injury by learning and doing gentle stretching exercises by the guide line of a doctor and the right way to lift things. Exercising: exercise in the water is especially safe for a sore back. The water supports some of your weight, which can make you more flexible and lessen pain for chronic low back problems. Acupuncture: This chines healing practice may bring relief for people with chronic back pain. Gently placing thin, dry needles into your skin at a specific points may trigger the release of endorphins, your body’s natural painkillers, or it may be changed your brain chemistry so you have a higher pain tolerance. You should use it along with other treatments for back pain. Massage therapy: Applied to the low back, massage therapy can relieve the muscle spasms that usually contribute to back pain. Massage therapy for pain is also increase blood flow to the low back, which speeds up healing by bringing nutrients and oxygen to damaged muscles. If you are looking for a Natural way to treat chronic back pain come and experience our Chinese hospital for back pain treatment in Lahore. We will provide you fix remedy for back pain treatment in Lahore through traditional Chinese herbal medicine and Chinese modern technology. For other information call us� 03171172688 or� live chat with our experts…!